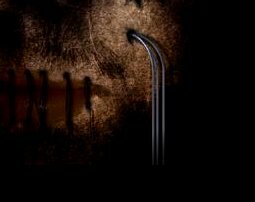 (C) Copyright amuQ Creations 2001. All rights reserved. 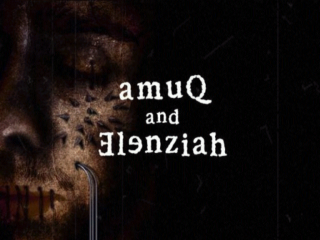 "In Search Of Happiness" is amuQ creations and Elenziahs' contribution to the Demo competition at The Party 2001 demo party held in Aars, Denmark from the 27th of December to the 29th of December of 2001. 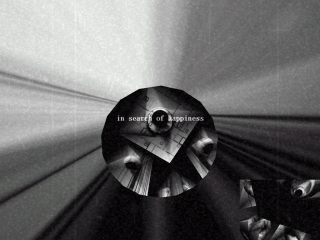 Where to get "In Search Of Happiness"
The history of "In Search Of Happiness"
In Search Of Happiness has, similar to The Blue Moment, a longer history than all the other demos we made. At the beginning, we planned to make a demo for the Mekka & Symphosium 2001, based on a story board made by Morph/Elenziah. Since we were not that productive til the party, and had in fact nothing but the story board, we quickly decided to finalize The Blue Moment at the party place and do the demo for the Assembly 2001. In the summer, Mika (vulc) and Felix (the lazy one) made the demo at Mika's place, and it got almost finished (we never get it done in time ;-)) for the party. We got it to the party place in time this year. Unfortunately we noticed some strange music crashes on some Win2k boxes we tested the demo on at the party place, but since we had no computer with us we were not able to hunt them, but just hoped it would work on the compo machines. The good thing was, that the music worked fine on them. But the demo crashed when tried to use bump mapping with Radeon based cards, and since ATI got main sponsor of the party all compo machines were equiped with Radeons. This was why our demo was disqualified. To make it even worse, the Assembly organizers also put our demo (remember it was disqualified) onto their FTP, though we planned to release a better version later. 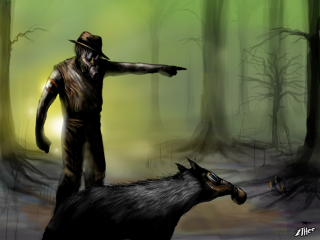 We then planned to polish it up a little and fix the bugs so we can release it at the Dreamhack party or at The Party. The Radeon bug got fixed quite soon after our coder got hold of a Radeon card (the Radeon drivers were the ones to blame for the crash), and the demo got enhanched, some effects placed and a few images got added. Finally, ready for The Party 2001, we had completed the demo (in our eyes) and that was it :-). 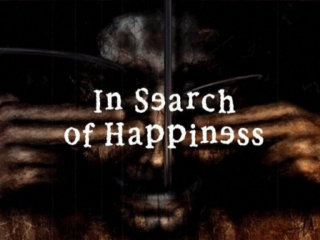 The story board of "In Search Of Happiness"
In the beginning, two title screens are shown, the first featuring "amuQ and Elenziah" and the second "In Search of Happiness". 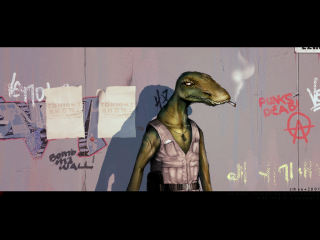 The background picture was drawn by Johan (Carrier). 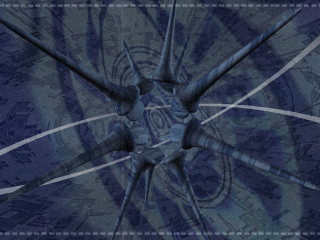 Then, you find yourself in a small room, seeing the title screen on a computer monitor with a blue screen flickering. The room also contains a nice particle object. 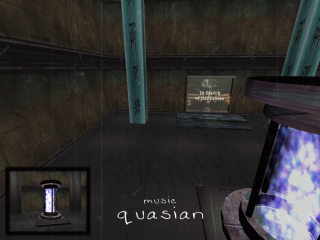 The credits are shown, and the camera flys through a vortex which opens in one wall. After that, you fly through a set of cubes with holes. "Meaningfulness is always the key for being happy, knowing what to strive or live for is necessary not to feel crappy. Meaningfulness requires concentrated dedication, a big exclusion of your everyday-life masturbation. Meaningfulness is always in need of a self-delusion, making you able to stay out of all confusion." The next scene is framed by two pictures by Zthee/Elenziah, which are shown before and after the scene. 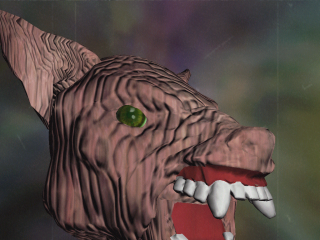 The scene itself features an animated werewulf's head. 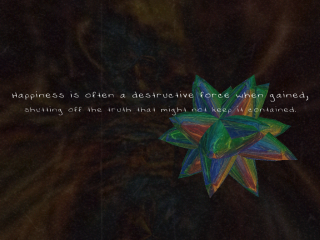 "Happiness is often a destructive force when gained, shutting off the truth that might not keep it contained. Happiness makes you question less to stay where you are, a new realm is shaped where you are the everlasting star. Happiness is often the feeling that turns you into a complete fool, constricting so much you're no longer a living being but just a tool." 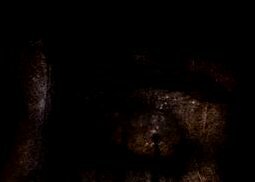 The next part features a nice additive alpha clound in the background, in which you can recognize several human faces, and as a shadow the face of a dog. 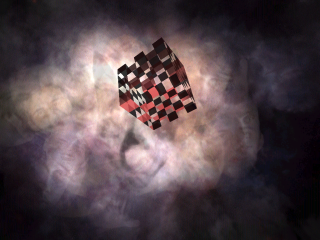 In the foreground, there is a animated translucent checkerboard-cube dancing on the screen. 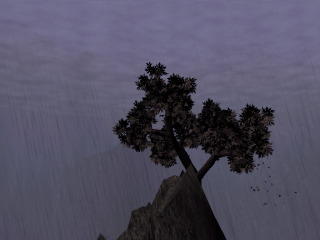 The next scene plays in a dark valley, where in a lake you can see a mountain with a single tree on its top. The weather is bad, it is raining like hell. Everything is in dark colors, and you can suddenly see a group of leaves flying away from the tree. 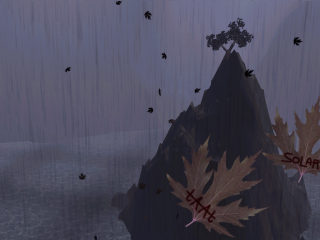 The camera flys along a little with the leaves and you can read the greetings on them. 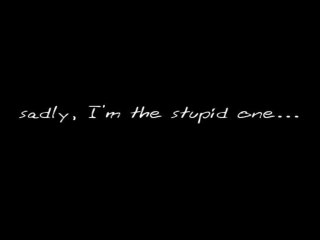 "All the happy people I see around me are either in love or just plain stupid, not thinking. Can one live and be happy without having someone to love, waste all feelings on and in a way live for — give up life for. 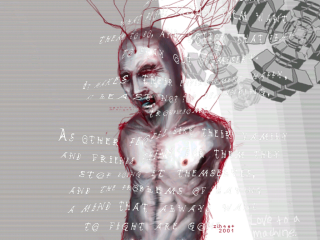 It gives them a point, a satisfying feeling killing the urge for a deeper meaning. the ones who are too afraid to walk their own paths in life and the ones who have given their life away. Group number one are in a prison built out of expectations, what people around them want them to do, and follow that plan to stay out of misery. It makes their environment happy, at least not too demanding, troublesome. As other people like their family and friends think for them they stop doing it themselves, and the problems of having a mind that always want to fight are gone. Group number two are the ones who live for a religion that make someone else take their decisions, guide their way and take their pain. It's as comfortable as it gets. Both these groups of happy people have three things in common — they've traded their independent, questioning minds for happiness, they still consider themselves as thinking human beings, and they despise the people like myself. They have everything positive in life I haven't." 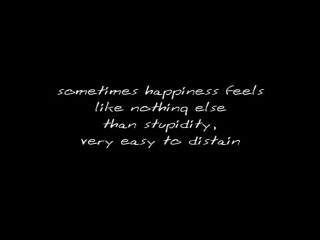 "Sometimes happiness feels like nothing else than stupidity, very easy to disdain. Sadly, I'm the stupid one..."
DSYS2 is an abbrevation for Demo System 2, which is a system which allows the creation of (3D) animations which can be shown in real time. Because DSYS2 is still under development, you can just check out some other demos made with it. You can get them from the CHEAT THE MACHiNE homepage, which can be found at www.amuq.net/ctm. 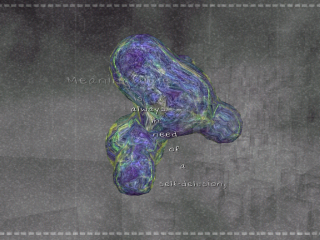 The demos (re)made with DSYS2 are called "Anton 4 - find ich gut!" and "CTM - the older demos! ".